The perfect complement to your gold chain! Can you imagine the impact of these pieces, even with jeans and a simple white T-shirt? Our most classic shape, handcrafted in solid 18K gold. This cross measures 1 inch long. Solid gold bail and back. Avaialble in all our stones. Our most classic shape, handcrafted in solid 18K gold. This cross measures 1.5 inches long. Solid gold bail and back. Avaialble in all our stones. Our most classic shape, handcrafted in solid 18K gold. This cross measures 0.75 inches long. Solid gold bail and back. Avaialble in all our stones. Big, gorgeous cross handcrafted in 18K Gold cross with inlaid extra blue Lapis Lazuli. Solid gold back.This pendant measures 1.5" long, including bail! 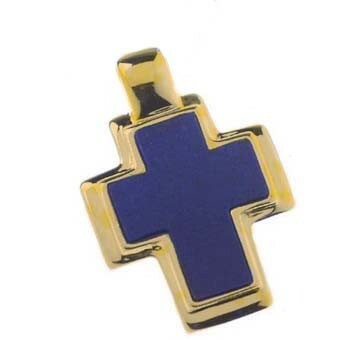 Big, beveled 18K Gold cross with inlaid Lapis Lazuli. Solid gold back. Solid 18K Gold charm with inlayed stone. Length: 1 inch. This charm has a 'map' detailing the positioning of the planets in the Signs at the specific moment of an individual's birth. The chart is rendered by using the individual's place, date and time of birth as the data source for this planetary snapshot. It measures 1 inch in diameter! Solid 18K gold wire charm with inlaid stone. Offered in two sizes: 0.5 inches in diameter and a sizable 1 Inch in diameter. Exquiste, handcarved, extra blue Lapis Lazuli heart pendant hanging from a handcrated, solid 18K Gold bail. The Ankh, also known as key of life, the key of the Nile or crux ansata, was the ancient Egyptian hieroglyphic character that read "eternal life". 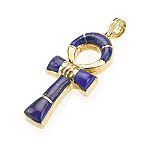 It was often crafted in Lapis Lazuli in ancient Egypt, buy only few of these extraordinary pieces survive to this day.